Licensed From – Ba Da Bing! Fantastic album. You really are transported to the streets of Nantes and homes of France. The record could barely be mastered any better. As well as this I have to mention the albums back side which contains some text, not lyrics, but a short story of sorts. It completely fits to read even while listening and is superbly written. Something which many might overlook. Overall Im hard pressed to find anything negative about this release. Update: With a new cart and knowledge about vinyl playback I thought I should add some remarks I didnt pick up on first few listens. Firstly, the S's on some tracks are overly emphasized. The first few songs especially, while Cliquot is just fine. I suspect different recording studios or mixes were used and some songs suffer because of it. Secondly, the press is not entirely quiet. There definitely is some surface noise at times and the occasional pops. Not bad though. This also leads into my biggest complaint directed towards whatever pressing plant made these records, being the quality control. My copy has clear fingerprints all over as well as plenty scuffs that I assure you did not come from me. Side B even has a big gash across the entire playing surface, thankfully it plays better than it looks. Some of the sound anomaly complaints might be because of the lack of quality control however. With a clean up Ill update once again for any improvements. The deadwax looks really smooth so I suspect its more silent than it actually plays at the moment. 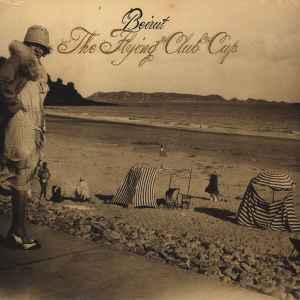 This album lives at the begining of the last century, Beirut could quite easily be singing in the corner of or outside the workhouse, for me there is a lot of heartfelt emotion here. I think these songs are like Hemingway's short stories,intelligent and enjoyable. Forks and Knives transports you to the hospital bed they sing about (you're spared the pain) you could be a soldier there contemplating life. Religion is here as well "I was standing outside the church door " takes me outside that door! You can't ignore the Mexican influence in their work, Chanson is a word which immediately springs to mind as well, if you've heard Jaques Brel's Le moribond they covered it on their elephant gun E.P excellently, you would think they wrote it themselves! Not everyone will like this in fact when I got it the guy at the record shop said he hated it, but it was his biggest seller!